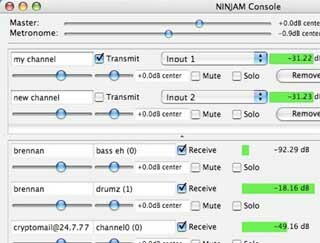 NINJAM is a program to allow people to make real music together via the Internet. Every participant can hear every other participant. Each user can also tweak their personal mix to his or her liking. NINJAM uses compressed audio which allows it to work with any instrument or combination of instruments. You can sing, play a real piano, play a real saxophone, play a real guitar with whatever effects and guitar amplifier you want, anything. If your computer can record it, then you can jam with it. Since the inherent latency of the Internet prevents true realtime synchronization of the jam2, and playing with latency is weird (and often uncomfortable), NINJAM provides a solution by making latency (and the weirdness) much longer. Latency in NINJAM is measured in measures, and that's what makes it interesting. The NINJAM client records and streams synchronized intervals of music between participants. Just as the interval finishes recording, it begins playing on everyone else's client. So when you play through an interval, you're playing along with the previous interval of everybody else, and they're playing along with your previous interval. If this sounds pretty bizarre, it sort of is, until you get used to it, then it becomes pretty natural. In many ways, it can be more forgiving than a normal jam, because mistakes propagate differently.